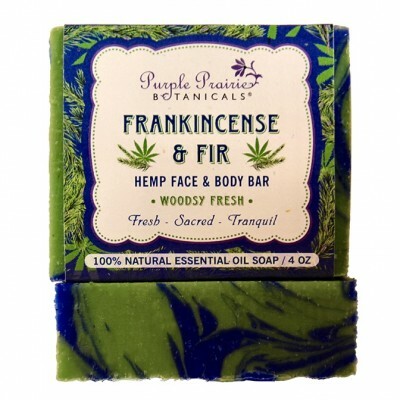 Like a walk in the woods, this soap will infuse your skin with "fresh as a forest" aroma and bring harmony to the senses. These two powerful oils have endless emotional, skin and medicinal benefits. Woodsy fresh! 4 oz. bar. Aromatherapy Benefits: Fresh, Meditative, Purifying, Tranquil, Releases Spiritual Energy. Directions: Lather up. Rinse up. Freshen up. 100% Natural Ingredients: Saponified oils of organic cocos nucifera (coconut) oil, organic elaeis guineensis (palm) oil, organic olea europaea (olive) fruit oil, organic helianthus annuus (sunflower) oil, cannabis sativa (hempseed oil), abies siberica (fir needle), boswellia serrata (frankincense) essential oil, styrax benzoin extract, iron oxide.